The Laura Becker Blog: Three Bean, Because Four Bean Is Just Showin' Off! Three Bean, Because Four Bean Is Just Showin' Off! 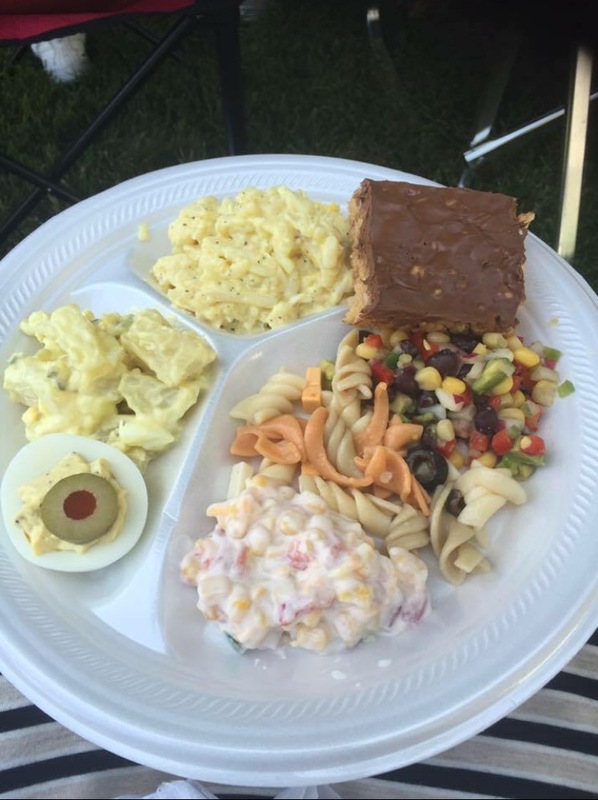 There is an unspoken etiquette to an Iowa potluck. And although I have moved far and away, it is forever stuck in my mind just like the no longer legible masking tape nametag permanently adhered to the bottom every Midwestern cake pan. These unwritten rules are difficult to discern, even from smack in the middle of the covered dishes and casseroles. It’s kind of that whole “can’t see the forest for the trees” thing only you can’t see the picnic for the potato salads. Oh, these mild mannered Midwesterners may respond with their signature simpatico as you stamp on their carefully crafted corn country customs and will likely pardon your transgressions should your zip code begin with anything other than a five, because obviously it’s not your fault you weren’t raised right. But after your first paper plate piled high, you’d better pick it up quick or you won’t be coming back. First off, unless the event is at a restaurant, it is a potluck. Always. Every time. No matter what. Even if the hostess states herself, “Oh, you don’t need to bring anything,” if you show up empty handed, you’re a schmuck or the Iowa equivalent which is even worse…rude. As it clearly states in the song IOWA STUBBORN from THE MUSIC MAN “Join us at the picnic. You can eat your fill of all the food you bring yourself.” This is the absolute truth. So everyone always brings more than anyone could possibly eat, because if you don’t go home with at least a third of what you brought left over, then you didn’t bring enough and everyone knows it. Now if you go home with almost all of it, then you’re just a terrible cook and that’s something else entirely. The first time I attended a potluck in California, we ran out of food...at a church no less! In Iowa this is an absolute abomination. If Jesus Christ had tried to feed the five thousand in Des Moines, it never would have come to that because all of those disciples would have been divided up alphabetically assigned to bring salads and so on with signups after service months in advance. And there would have even been those small, plastic, Tupperware-wannabe containers on hand, an absolute modern miracle, for the leftovers so the flock could finish and still take a little something for the road. And they would have made it all themselves because homemade is the only thing considered a covered dish. Store bought is not lazy, it’s thoughtless because there’s no sentiment in shrink-wrap. Besides, everyone will know from the prominent pricetag just how much you value them, down to the penny. Even if you pour it into your own Pyrex and try to pass it off as your own product, unless you bought it two counties over, someone will know exactly where it was purchased and for just how much, which they will keep to themselves…while you’re still present. Lazy is anything less than three bean salad. And it’s only three bean, because four is just showin’ off. The grand total of whatever you bring, must be at least five ingredients. They don’t all have to be in the same bowl, just in the same household. If you bring vegies there’d better be white dip, nothing weird. And if you bring the weird one, you’d better bring the white one for everyone else. There had also better be at least 3 different vegetables and no more than five because that’s just confusing. Fruit requires mini marshmallows or gelatin or both. If not, you better have brought something else to supplement. The host or hostess will always provide the table service. Divided Styrofoam or on the paper front, doubly durable Chinet. Anything less shows a lack of class. And real dishes are just outright snooty. Every plateful must contain at least three items from the following food groups: Potatoes, pasta, pimentos or peanut butter. There must be at least one unidentifiable item on your plate. You don’t have to like it, but it better be there. And never, not ever, no matter how badly you may want it, take the last of anything. Finally, even if the host bids you good-bye, saying “we’ve got this,” you fold a few chairs, wash a few dishes, wipe a few tables, or at the very least take out the trash on your way. It’s what they would do for you. And will do for you whether you want them to or not. Because it’s how they were raised and how you should have been raised, even though, bless your heart, it wasn’t your fault. It’s the proper way to potluck. The Iowa etiquette of the covered dish.